A-HOTEL.com - Luxury and cheap accommodation in Nizhniy Munay, Russia. Prices and hotel, apartment booking in Nizhniy Munay and surrounding. Apartment v Pospelovo is set in Tashtagol. Complimentary WiFi is featured. Boasting accommodation with a balcony, Apartament na 8-e Marta 4 is situated in Tashtagol. The property was built in 1988, and features accommodation with free WiFi. 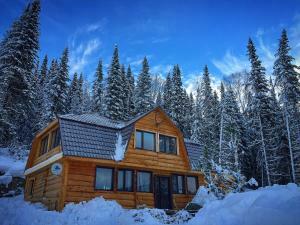 Located in Turochak, Usadba Lebed provides accommodation with free WiFi. Some units also have a kitchenette equipped with a fridge and stovetop. Set in Tashtagol, Гостевой дом Русский offers barbecue facilities. Among the various facilities of this property are a garden and a terrace. Hostel U Lesa is set in Sheregesh, within 10 km of Kaskad-Podyom Ski Lift and 14 km of Sector E Ski Lift. The property is located 9 km from Panorama Ski Lift and 10 km from Shoriya-tur Ski Lift. Featuring ski-to-door access, Hotel Olymp is situated in Sheregesh in the Kemerovo region, 300 metres from Kaskad-Podyom Ski Lift. 10 km from Sector E Ski Lift and 100 metres from Sportotel Ski Lift, the hotel provides ski storage space. Situated in Tugun in the Kemerovo region, Chalet_Det_House features a terrace and mountain views. Guests have access to free WiFi.